Not to be confused with Brachiopod. Branchiopoda is a class of crustaceans. It is the sister group to the other crustaceans. They are mostly small, freshwater animals that feed on plankton and detritus. However, many of the Cladocera are marine. 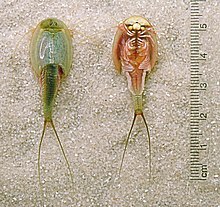 Branchiopods have gills on most of the animals' appendages, including some of the mouthparts. The name means "gill-foot". ↑ Libbie Hyman (1961). "Subclass 1. Branchiopoda". The Invertebrata (4th ed.). Cambridge University Press. pp. 368–375. This page was last changed on 30 August 2017, at 22:23.